Discover what your eyes can't see and perform lasting preventative roof maintenance. How Preventative Roofing Maintenance Plus Can Work For You! Scheduled visual and infrared roof inspections, roofing maintenance work and minor flat roof repairs can prolong the life of a sound roofing system. This can also result in major savings associated with repairs to damaged interiors, production equipment, costs associated with paying for emergency repairs and prematurely replacing your flat roof. It's important to remember that over 90% of roof leaks and premature system failures occur at the roof details: walls, metal edges, flashings, protrusions, sheet laps, drains, etc... Proper identification and elimination of problems on a timely basis can circumvent a roof replacement and significantly extend the life expectancy of your flat roof. As most leaks are a result of small-scale failures this approach allows us to spot the problem before it has a chance to rain on your parade. How PREVENTATIVE ROOFING MAINTENANCE PROGRAM can work for you! A thorough 21-point Visual roof Inspection as well as Infrared Scanning. All work by our staff is guaranteed and regular check-ups are included in our commercial post roofing maintenance plans as our way of standing behind our work – 100%. We look forward to securing long-term relationships with our clientele based off the principles of satisfaction, service and quality workmanship. An out of sight, out of mind attitude toward your roofing systems is dangerous. It's also poor asset management. Too many owners and managers have been burned by premature roof failure. When water starts entering the building, hard assets, corporate profits and maintenance personnel start taking a beating. Use life-cycle costing to assure maximum roof life. Adapt a pro-active roof maintenance protocol. Perform semi-annual roof inspections and repairs. Budget a minimum amount, per year for preventative maintenance (beginning in first year). Track all collateral building damage and incidental costs associated with leaking roofs. Show management how past collateral damage costs exceed the cost of implementing a roof maintenance and management program.. Begin your roof maintenance program today. We recommend that you inspect commercial roofs semi-annually. 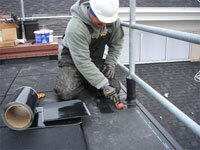 For more information on available commercial roofing maintenance programs contact RoofScan.ca.